"One-and-twenty button-holes of cherry-coloured silk! To be finished by noon of Saturday: and this is Tuesday evening. Was it right to let loose those mice, undoubtedly the property of Simpkin? Alack, I am undone, for I have no more twist!" 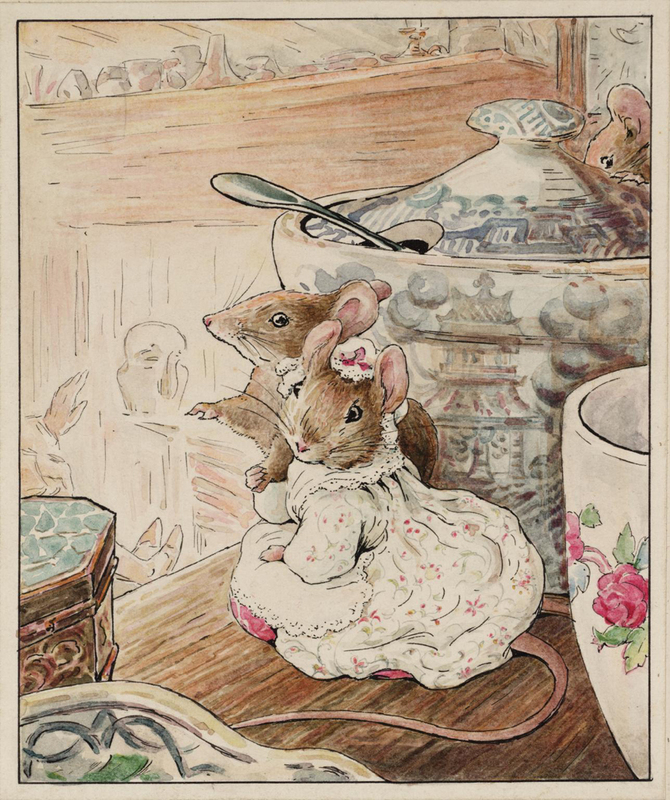 Beatrix Potter’s second story, The Tailor of Gloucester, tells the tale of a poor tailor who rescues a family of mice who were trapped beneath overturned teacups by his cat, Simpkin. These mice, grateful for his aid, help him complete the most important commission of his career, the wedding jacket and waistcoat for the Mayor of Gloucester. This watercolor shows the Tailor sitting by the fire after rescuing the two mice from beneath a teacup. The two mice stand on the counter with the tea service, listening to the Tailor ruminate on the difficulties he is facing in finishing the Mayor’s coat on time. Beatrix had already begun working on this story before her first book, The Tale of Peter Rabbit was completed. Even after writing numerous other tales, The Tailor of Gloucester remained Beatrix’s favorite. The Tailor of Gloucester was published in 1903, two years after Peter Rabbit by Frederick Warne & Co. once it was evident that Beatrix and her stories would be a success.